NASA has compiled the following transcript in an attempt to ascertain the events that led to the failure of Ares 1, the first manned mission to Mars, and to address concerns regarding the recent unscheduled departure of the command module from Martian orbit. As directed by the Senate Intelligence Committee, this transcript contains only the transmissions of Captain James L. Hargrave. Maintenance transmissions have been excluded unless otherwise deemed pertinent. This document has been classified TOP SECRET, and is not intended for public distribution. 2025-April-10 13:31:27Z Hargrave (Command module video): This is Captain James L. Hargrave, mission report, month three. The sleep is ghastly, or at least waking up is. Twenty-eight days is a long time to go without using basic bodily functions. The experience is very similar to the worse hangover I have ever had. All systems are nominal. I’m sure you can see that on your end, Mission Control. My sleep chamber is functioning properly; IVs and feeding tubes are in good shape with no signs of infection. Major Dorset is doing well – all her charts and numbers look good. The computer is set to wake her on schedule in fourteen days. I’ll be starting the mandatory exercise shortly but I’m really looking forward to cleaning this odor off of me. I tested the Torpor Project twice on Earth and I never remember smelling this bad. Not sure if this is an issue. I’m dreaming. I checked the monitor and it shows no signs of brain activity as per the Torpor Protocol. According to the computer the drugs are suppressing all brain activity and a persistent state of coma has been maintained between periods of revival. Still I’m dreaming. In my dreams, there are shadows moving all around me. After a short time they engulf my body. I think the dream occurs during the revival period, when my mind is starting up again. It’s likely my unconscious is grappling with the transition. Recommend adjusting the mixture for the Torpor Protocol before the next sleep. Hargrave out. 2025-April-10 15:44:52Z Hargrave (Command module video): That’s affirmative, Mission control. I’ll complete a full diagnostic on my sleep chamber. That new mix should do the trick; thanks for the help. I should be back in my chamber in approximately ten hours, fifteen minutes. Catch you in four weeks. 2025-May-06 13:33:21Z Hargrave (Command module video): Captain Hargrave, month four. We have safely passed the halfway point to Mars. It was another rough transition from torpor. I’m surprised my body is reacting this way. Maybe it is time to adjust the hormone therapy as well. How is Helen doing? Is she having similar issues? I see you told her about my dreams. She made me a dream catcher out of paper. Unfortunately the dreams didn’t go away. They are similar to the earlier ones except this time there is a voice. It is calling to me from a far off place. I’m open to suggestions. Hargrave out. 2025-May-06 16:21:13Z Hargrave (Command module video): You guys took a little long to reply. I hope you will keep me in the loop with all your concerns, Mission Control. Glad to hear Helen is not having any issues with her sleep. Not sure if I agree with your plan. I understand why you want to monitor my dream state but won’t letting me dream during torpor be risky? That’s the purpose of the chemically induced coma, right? So our mind is not aware of the passage of time even on an unconscious level. You’re right, though. What other choice is there? If the dreams aren’t addressed the mission will have to be scrubbed and no one wants that. Okay, let’s do it your way. 2025-June-05 13:22: Hargrave (Command module video): Hargrave, month five. All systems are nominal. My tubes are looking a little ugly, request permission to change them. I feel better this time around, more rested. The change in hormone therapy seems to have worked but the dreams continue. They’re different this time, off the charts scary. I hope monitoring my dream state helped. Were you able to make some progress on the coma cocktail? My dream was a vivid and cogent memory of my parents. My mother and father were archeologists and dragged me everywhere they went. When I was seven, they took me to a remote part of Mongolia, convinced they had made the find of a lifetime. On one of the lower Himalayan peaks they discovered a column which they believed belonged to an as yet undiscovered civilization. It was octagonal and made of a dark green stone. Its surface was pitted with hundreds of small runes. Weeks, then months passed as my parents attempted to identify and decipher the writing. They had no success but after speaking with the indigenous peoples, they learned of a cave in which the locals described ancient structures. A lost and ancient civilization was buried under the mountain. That cave dominated my parents to the exclusion of all else. They remained inside its dark foreboding depths for days at a time. If it were not for the kindness of a local family, I would have likely starved. My parent’s last expedition into the caves lasted for weeks and they were long overdue. I was afraid they would not return. Finally my father emerged but something was wrong. He was covered in dried blood. Large black and red flakes of the stuff coated him, particularly around his mouth. It was not possible to tell how much of the blood was his and how much was not. His eyes were glazed over and his expression suggested his mind had snapped. I wanted to call out to him but his appearance stopped me. He attacked a native woman like some rabid carnivore. Men came to subdue my father but he was berserk with bloodlust, biting and clawing anyone who got too close. More than one man lost a chunk of flesh to his gnashing teeth. Finally, they shot him. Before my father died some semblance of awareness returned to him. His last words to me were, “James, I have touched the face of God.” My mother’s body was never recovered. Not all of you know, but all of this is in my records. I really thought I was past it but here it is all in my dreams. Right now, I still feel pretty good but deep down I know the seeds of madness are growing. I must admit that I am questioning the decision to let me dream. The data you gained gave you something to work with, I hope. Going forward I don’t think it a wise decision to let me enter torpor in anything less than a coma-like state. I know that I was not the first choice for this mission because there was a question about the trauma in my past. The truth is, I was happy just to be the alternate. Bet I’m not the only one regretting I was tapped as a last minute replacement for this mission. I’ll do whatever it takes to keep the mission alive. I am open to suggestions. Hargrave out. 2025-June-05 16:04:42Z Hargrave(Command module video): Mission Control that’s an excellent idea. I’ve already programmed the computer to wake Helen. Because we are reviving her two weeks early, she’s in for a bumpy ride so I’m bringing her out of it slowly. She should be conscious in thirty-six hours. I’ll be back in the sleep chamber by then, please say hello for me. After we arrive at the Red Planet we’ll reassess my condition and decide if the mission continues. There is no turning around until we get to Mars. So as far as I’m concerned, we are a go. Helen is sure to have some questions for you, so don’t send anyone home early on your end. 2025-July-31 13:50:56Z Hargrave (Command module video): Mission control, this is Captain James Hargrave, month seven. I’m looking out over the Red Planet. It’s gorgeous, reminds me of a marble I had when I was a boy. It’s good to be back. Looks like your plan worked. I feel great, mentally and physically. Both Helen and I are awake. It’s nice to speak to another human being face to face again. I apologized to Helen for having to pick up my maintenance shifts for the last two months. Keeping me in torpor for the last part of the trip seems to have worked. Helen told me you guys kept her out for two weeks so she could monitor my situation and make any needed changes to my sleep chamber. Apparently, you guys adjusted the formula more than once. Well, whatever alterations you made worked. So without further delay, here is the maintenance report. Both Helen and I are awake and doing well. All feeding tubes and IVs have been removed without issue. The command module has deployed its solar panels and all systems are powered up. Our landing window is coming up a little faster than we had planned, approximately forty-six hours. Preparations are on schedule with the Mars landing module and should be complete in ten hours. All we need now is for you guys to turn the key on your end and give us the green light. 2025-August-02 15:41:49Z Hargrave(Mars landing module Audio): Mission Control, this is Captain James Hargrave and Major Helen Dorset from the Mars landing module. We are releasing the docking clamps and preparing to disengage from the command module. By the time you receive this transmission, we will already be on the surface of Mars. Hargrave out. 2025-August-02 16:19:29Z Hargrave(From the surface of Mars. Text): Mission control we made it. We had a rough landing though. A freak wind tore off one of the chutes and blew us off course. Our landing was a little less than controlled. We made liberal use of the retro rockets but still left a trench a quarter mile long in the sand. You should have no problem locating our position via satellite. The bad news is the landing module is a total loss. Our gear is scattered across the Martian desert and most of that is now useless. We have lost our uplink to the command module and have no way of receiving transmissions. There is some good news. I was able to repair our transmitter but we aren’t able to generate a very strong signal. Until we reach the habitat, all communications will be in text format. Mars global positioning has us almost ninety-six kilometers from the designated landing zone. Pressure suits are stable and the inflatable dwelling is set up and working. In the morning, we’ll collect our things and start walking to base camp. I’ll have a more detail status report then, Hargrave out. 2025-August-03 12:36:16Z Hargrave(From the surface of Mars. Text):We are all packed up and leaving for the Habitat. Both of us sustained heavy bruising as a result of the landing. We are in some pain but nothing we can’t deal with. If you are thinking we are lucky to be alive, you’re right. Wait till you see the wreckage from the satellite photos. Our food and water situation could be better. The fact is we can’t carry all of it in one trip anyways. Our pressure suits are in good shape and the embedded voice-to-text systems are operational. Short range communication systems between the suits are functioning properly as well. The dwelling requires a lot of juice to inflate. Pumping in all this thin Martian air takes a lot of time and electricity so I’m limiting our transmissions to approximately once every twenty-four hours to conserve power. We have our work cut out for us. According to my map, we will have to circumnavigate a small unnamed canyon to reach base camp. Wish us luck. If we don’t make it to base camp in four, five days tops…well, you know what that means. Next contact in twenty four hours. Hargrave out. 2025-August-04 12:42:32Z Hargrave(From the surface of Mars. Text): It gets real dark here at night. The lander photos from earlier missions just don’t prepare you for it. A deep blackness cloaks the land. You can only escape it by looking into the sky. Phobos and Deimos are definitely the brightest objects but not nearly as bright as our moon. Beyond the moons, the sky is filled with stars. I’ve never seen so many. I can even see earth, it’s beautiful. A view like this wouldn’t be possible back home. Our progress is slower than I expected. The low gravity combined with the pressure suits makes walking awkward. I am hopeful though. We should be able to reach base camp before we run out of supplies. Hargrave out. 2025-August-05 12:38:07Z Hargrave(From the surface of Mars. Text):Mission Control, we’ve had an accident. While traversing the rim of the canyon at what we thought a safe distance, the sand under us shifted and drained into the canyon, carrying us with it. Fortunately, as Martian canyons go this one is small. Still, if a fall from this height occurred on Earth we would be dead. We did not emerge unscathed, however. Both of us received several sprains and multiple minor punctures to our pressure suits which we have repaired. Like I said, it was a long fall but we are alive. While searching for a way out of the canyon, we discovered steps carved into the natural stone. They wind up the side of the canyon for at least a kilometer. They are not some trick of nature and had to have been carved by intelligent beings. They are old by any reckoning and we were stunned when we found them. We climbed the stairs and made yet another discovery: buildings in the rocks. These structures were massive and composed of a substance I could not identify. It is possible that we only saw the tops of these structures. There could be a whole city buried here. The rock of the cliff face looks to have formed around the buildings in the remote past. That rock is millions, perhaps hundreds of millions of years old. We observed hundreds of sedimentary layers within the rock of the cliff face and it is likely this whole region was under water at some point. As exciting as the find should have been, we both found the experience unnerving. The shadows here seem to move. A trick of the eyes, I hope. Helen swears she sensed a presence. It’s not a scientific conclusion, I know, but it felt as though we were being watched so we left as soon as we could. 2025-August-06 12:31:44Z Hargrave(From the surface of Mars. Text):Mission Control, our position is currently a day’s journey south by southeast of the canyon. The satellites should be able to see us. We made a second discovery shortly after we left the canyon. Rising five feet out of solid rock was a dark green octagonal pillar. It visibly pulsed with an unnatural green light when I touched it. The similarities of this pillar to the one in my dream are uncanny. I assure you it is real, I am not hallucinating. We have taken many pictures of the object; I’ll upload them as soon as we reach base camp. This is a monumental find but we dare not linger. The incident at the canyon has added significant time to our journey, maybe too much time. We must keep moving if we are going to survive. We will return to explore the ancient city, but for now we must move on. 2025-August-07 10:37:16Z Hargrave(From the surface of Mars. Text): Mission Control, our situation is deteriorating. Exhaustion has taken its toll both physically and mentally. Helen insists that she has seen shadows moving just outside the reach of our lamps. When we broke camp this morning, we found footprints in the sand. They came right up to the dwelling then moved off in another direction. I wanted to follow the tracks to see where they led but thought better of it. Helen is terrified, it goes without saying I am a little unsettled myself. We have unpacked our side arms and are now wearing them. Helen has seen shadows in the distance for the past two nights and refuses to let me turn off the light. I confess that last night I thought I saw something as well. The following facts are staring us in the face. Food and water are almost depleted. Our oxygen tanks are empty and we have had to resort to the chemical re-breathers. I am going to use the synthesizer to extract oxygen from the last of our water. This will use up our power reserves and we won’t have time to recharge the solar cells. So here is our plan: we’re leaving everything behind except ourselves, our suits, and the Mars GPS. We’re going to march until we drop. Do us a favor and activate the habitat remotely, we’re not going to be in any shape to do it ourselves. I’m guessing twenty hours. If we’re not at base camp by then, we’re probably dead. 2025-August-8 07:57:09Z Hargrave(Mars habitat audio only):Mission Control, we made it. We are alive. Will contact you again once we are rested. 2025-August-09 09:19:48Z Hargrave (Mars habitat video): This is Captain James Hargrave from the Mars habitat. As you know, we’re here. Helen passed out from lack of oxygen a kilometer from base camp, so I had to carry her the rest of the way. I’m really not sure how I made it. There wasn’t any more oxygen in my tank than there was in hers. Currently, Helen is still resting and has experienced brief moments of lucidity. We are beat up, Mission Control, but alive. The status of the habitat is nominal. The robot did a good job piecing the place together over the last few months. The reactor is up and operating within acceptable parameters. Thank God for nuclear power. 2025-August-10 09:37:25Z Hargrave(Mars habitat video): Helen is doing better and is now conscious. She saw a face in the habitat window last night. I did not see it myself, but I found more of those strange tracks leading up to the habitat. Considering recent events I think it’s time to admit the possibility that we are not alone. I’d like permission to take the Mars rover out and recover our gear both at the landing zone and the last place we made camp. That gear is irreplaceable. Besides I want to recover those photos of the city buried in the rock. 2025-August-11 09:08:43Z Hargrave(Mars habitat audio only):Mission Control, we did not get your last transmission. Instruments show a massive electromagnetic field emanating from the South Pole. I expect that we will experience trouble communicating until it passes. I’ve decided to take the Mars rover out and collect our equipment. I’ll be going as far as the last camp site to retrieve the gear we abandoned there. The equipment at the landing zone will have to wait a little longer. Helen is doing well and agrees that we should recover our equipment, especially the photos. She’ll hold down the fort while I’m gone. I will be heading out at eleven hundred hours. It should only take four hours, round trip. 2025-August-11 14:14:12Z Hargrave(From the surface of Mars. Text): Mission Control, we are definitely not alone. Good God, the thing was huge. It was a black and hairless humanoid. While I collected our gear, it appeared from behind a rocky outcrop. I was unnerved at the sight of the thing but managed to resist the urge to run. That was a mistake. It approached quickly, its long legs bringing it before me in moments. The creature swung at me as soon as I was in arms reach. I managed to jump back but not before its long talons sliced my pressure suit. It cut me right to the skin. Fortunately only one compartment of my suit depressurized and I didn’t lose much air. Without pause it swung at me again. I ducked and managed to land a solid but wild kick to the thing’s midsection. I knocked it back at least three meters and it landed face first in the red sand. At first I was stunned by the effect of my kick then remembered, because of the Martian gravity, I was about three times stronger here than on Earth. Without wasting any time I jumped into the rover and threw it into high gear. The thing got up and chased me. It leaped for the back of the rover and grabbed hold with its claws. I could hear its insane howls through the thin Martian atmosphere as it pulled its bulk onto the rover. I drew my 9mm, turned back and fired two shots at the thing. Even with my hands shaking I managed to score a hit. The thing’s head whipped back, black ichor spraying the air. If anyone was wondering whether or not bullets would fire on Mars, there is no longer any doubt. The thing fell from the rover but I kept driving until I felt I was at a safe distance, before I stopped to look back. As I watched, the creature stood up its body covered in red sand and what could only be blood oozing from its head wound. When it started moving toward me again I got back into the rover and drove off at top speed. This incident occurred approximately one hour ago. My heart is still pounding. I stopped to bandage my wounds and reseal my pressure suit. I lost a lot of blood. Painful muscle spasms are wracking my midsection. I don’t know if the cramps are caused by the wound or exposure to the low pressure of the Martian atmosphere. I’m wondering what we should do next. If there is more than one of these things, God help us. I’m going to prep the return capsule. I’ll have Helen activate it when I get back to the habitat. One good thing came of this: I retrieved the camera. 2025-August-11 15:43:26Z Hargrave(Mars habitat audio only): Mission Control, I made it back. I am transmitting the pictures I took of the alien structures and obelisk. Helen and I are in agreement we are making preparations for the return trip. We’ll have to remain in Mars orbit for a while though. Helen tells me Mars and Earth may not be in optimal alignment for up to fourteen months. We have lost the uplink with the command module but as soon as this electromagnetic storm passes we expect communications with both you and the command module will be restored. Once that happens we are leaving. 2025-August-12 09:13:29Z Hargrave(Mars habitat audio only): Mission Control, there has been no sign of the creature. There has been another development, however. My wound has become infected and I have a slight fever. I have taken heavy doses of antibiotics but it doesn’t look good. Helen has finished prepping the return capsule. As soon as the uplink is restored with the command module, we are leaving this rock. 2025-August-13 09:20:58Z Hargrave(Mars habitat audio only): My fever is now at 102 but the infection seems to have slowed. I’m dreaming again. It’s this damn fever. It all seemed very real and tangible, a place that I can go back to if only I remembered how. The alien city, I saw it as it once was. It must have been millions of years ago because all the rock is gone and two thirds of the planet is covered in water. Much of the world’s land mass is blanketed in lush green vegetation. Mars is alive! A city sprawls for hundreds of kilometers across the surface of the southern continent. Sickly green towers claw at the sky as if seeking prey. The inhabitants are vile, pus covered monstrosities, with masses of fluttering tendrils topped by translucent bulbous heads. Their brains are suspended within a cerebral fluid. These things worship a dark being who resides beyond our reality. They call to their dark god and it comes to them. The sky turns dark as its shadow engulfs the city. It’s both beautiful and horrifying, an ancient evil come to bless them in bloodshed. It descends upon the planet and devours those who dared summon it. When the dark god is done, it pours its being into the planet and Mars dies. It’s still here, in a lucid slumber deep within the planetary cadaver, waiting to be summoned once again. I can hear it even now, calling to me. 2025-August-13 22:47:21Z Hargrave(Mars habitat audio only): (Major Dorset can be heard crying in the background.) Mission Control, it came back. It shook the whole habitat. We are venting atmosphere from multiple locations and we have warning lights on the reactor. 2025-August-15 13:27:31Z (Data link to Mars Habitat restored. Internal sensors show the habitat has depressurized. Power to most equipment has failed. Internal Camera 12 is still functioning and reveals extensive damage. 2025-August-17 16:48:14Z Hargrave(From the surface of Mars. Text):It got her. God save me, it ate her alive. The thing was toying with us. It forced open the door to the habitat. Only demons can do such things. It must be a demon, it has to be. I shot it so many times but the bullets only pushed it back. When I ran out of ammunition it attacked Helen. I squeezed into the small closet where the servers are and watched as it devoured Helen. She didn’t die quickly, she lingered as if some force delayed her passing. Her eyes begged for death, her screams pleaded for it. God it was awful. When it was done the demon looked at me and for the first time I noticed its eyes. It had my mother’s eyes, dark ocean blue eyes with flecks of green. It grinned, revealing a maw filled with bloody fangs. I swear it was a smile. Then it just left. I know where the dark god is, and it is calling to me. Its voice in my mind is a deep baritone that I can no longer resist. My life is over, I know that now. My soul doomed as well but I leave you this warning: Do not come back to Mars. 2026-June-12 07:17:03Z Hargrave(Somewhere on the surface of Mars, Audio Only): I have touched the face of God! I am bringing him home. 2026-June-19 10:28:32Z (Long range telemetry is tracking the Mars command module on its way to Earth. It is followed by a second object which rose from the surface of Mars. The second object is massive – almost nine hundred kilometers in diameter. At their current speed and trajectory, both will rendezvous with earth in approximately fifteen months. D.B. 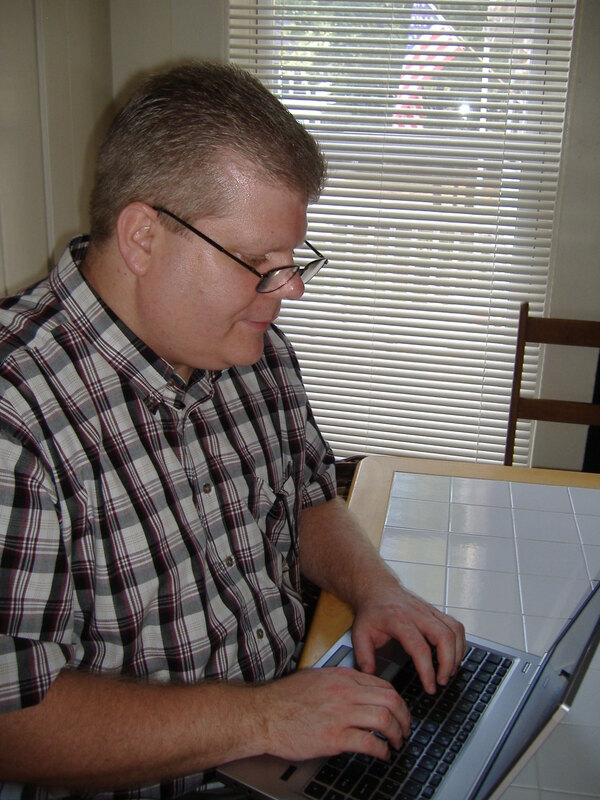 Poirier is freelance writer, I.T. professional, and entrepreneur. His credits include; “Peng” Here There be Dragons anthology, “Baptism” Daily Frights 2012: 366 Days of Dark Flash Fiction (Leap Year Edition), and “Cimmerian” jukepopserials.com. He is motivated by his love of speculative fiction; some of his favorite works are Enders Game by Orson Scott Card, The Sword of Truth series by Terry Good Kind, A Princess of Mars the Barsoom series by Edgar Rice Burroughs, and The Call of Cthulhu and Other Weird Stories by H.P. Lovecraft. A New England native, he lives with his wife, two daughters and their goldfish “Flipper” in the great state of New Hampshire. Doug’s websites: www.dbpoirier.com , www.facebook.com/DBPoirierWriter , www.jukepopserials.com . If you enjoyed this story, let Douglas know by commenting — and please use the Facebook, Twitter, and Google Plus buttons below to spread the word. Story illustration by Warren Layberry. Really enjoyed the tale-Nice it tied in with Ares II as well. 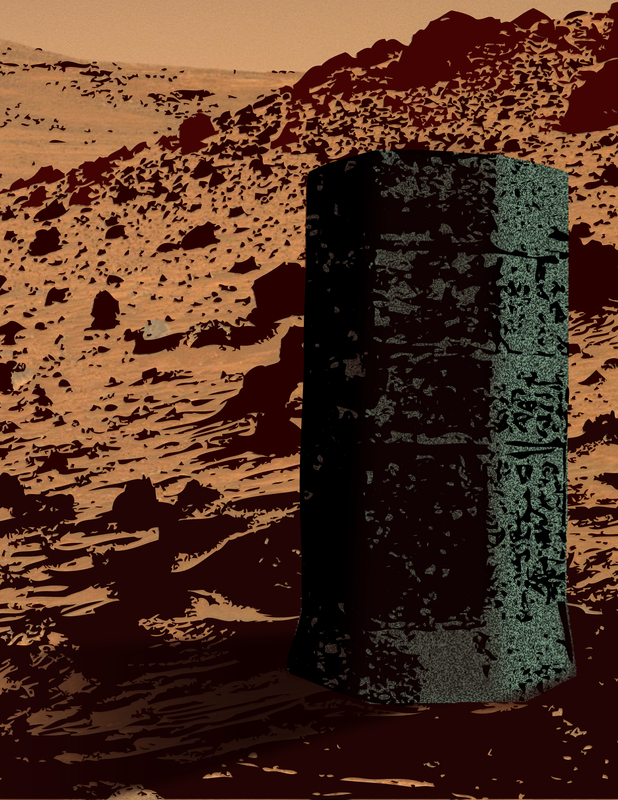 D.B., a very professional tale bringing back the Mars from the Golden days of pulp. Loved Red Sands! It was riveting the whole way through! What a great story. I really enjoyed reading it and look forward to more works. Jeez, science is creepy! Just starting out with Hargrave talking about how he has no normal bodily functions, and having to go into a drug induced coma to shrug off the effects of time passing. Valuable, yes, but scary! Then comes the monster! This was a great story, and we can definantly tell you’re an Edgar Rice Burroughs fan, that’s what I was thinking as you were reading. I Really enjoyed this and I loved the Burroughs cameo. I also loved the transmission format. Can’t wait to read more of your stuff. Thanks! Really great read. I normally don’t comment on items online, but this was something that had a nice tie-in and kept me glued to the outcome. Thanks.